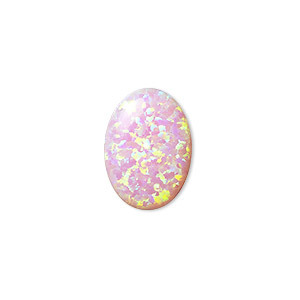 Cabochon, "opal" (silica and epoxy) (man-made), pink, 14x10mm calibrated oval. Sold individually. Item Number: H20-3212CB Have a question about this item? Made to emulate the look of high-quality natural opals, the universe of color and outrageous flash of man-made opal is truly captivating. All the splendor of natural opal, manufactured into a harder composite that withstands heat and cold. Comprised of approximately 80% silica with 20% added epoxy for hardness and consistency. Well calibrated to fit standard cabochon settings. 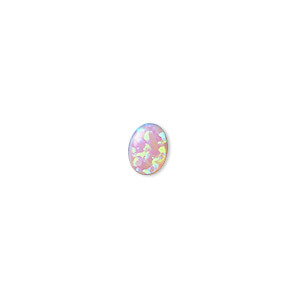 Cabochon, "opal" (silica and epoxy) (man-made), pink, 18x13mm calibrated oval. Sold individually. Cabochon, "opal" (silica and epoxy) (man-made), pink, 10x8mm calibrated oval. Sold individually. Cabochon, "opal" (silica and epoxy) (man-made), pink, 8x6mm calibrated oval. Sold individually. 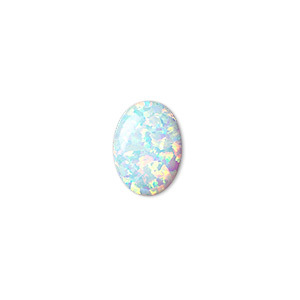 Cabochon, "opal" (silica and epoxy) (man-made), white, 14x10mm calibrated oval. Sold individually. Cabochon, "opal" (silica and epoxy) (man-made), light blue, 14x10mm calibrated oval. Sold individually. 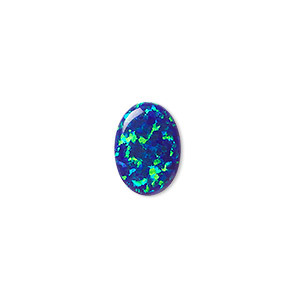 Cabochon, "opal" (silica and epoxy) (man-made), dark blue, 14x10mm calibrated oval. Sold individually. 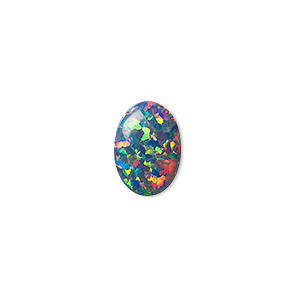 Cabochon, "opal" (silica and epoxy) (man-made), multicolored, 14x10mm calibrated oval. Sold individually. Cabochon, "opal" (silica and epoxy) (man-made), pink, 6x4mm calibrated oval. Sold per pkg of 2. 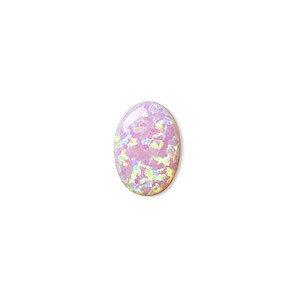 Cabochon, "opal" (silica and epoxy) (man-made), pink, 7x5mm calibrated oval. Sold per pkg of 2. Cabochon, rhodochrosite (natural), 14x10mm calibrated oval, B grade, Mohs hardness 3-1/2 to 4-1/2. Sold individually.